Heena Attar is prepared by hydro distillation method from Mehndi flower. This attar is prepared using base of Pure Sandalwood oil and has a balancing smell of both Heena & Indian Sandalwood oil. It has tenacity of approximately 12 hours. As we use natural source to prepare Gul Heena attar, this is available in form of uncut, long lasting, alcohol free and high grade essence oil. We are a Marketing company of "AYU HINA". 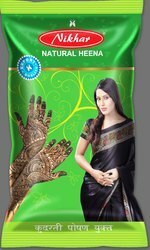 Our products like "AYU HINA" for blackening and conditioning hair adding a great ethnic flair in the henna products by imbibing latest trends to exhibit variety and quality. Henna makes your hair shiny, healthy, and strong! "AYU HINA" brand is having well established sales in India and as well as in foreign with our existing distributors. Color: Soft Balck, Soft Brown , etc.